The focus of this course is not just on the end result of making activities, but includes the theorizing of processes, practices, tools, technologies and their formation. 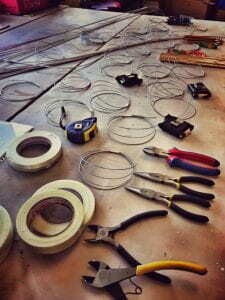 The main project this semester will be the design and fabrication of a pavilion built on the principles of wire-bending. As automation, machine learning, computation, robotics, and artificial intelligence reconfigure design, we explore how existing conceptions of making might be modified in conjunction with these technological changes. Investigating this intersection of wire-bending, computation, digital design and fabrication will challenge students to develop new ways of understanding making, and conducting inquiry based on the meeting of hand, form, material, computation, technique, and the digital. This semester we investigate how we might reconceptualize craft practices through computation. We will explore how making practices might change the way we think about computation and technology, and explore critical perspectives and insights into the roles of computation and technological systems in craft (design + making) and vice versa. You will learn how to use craft as a site and method for critical, poetic, and speculative thinking about computation – rather than mere making by hand. The end goal is publication of new knowledge from our exploration. You will learn: (1) a computational theory on wire-bending; (2) how meaning and intent is constructed in making practices; (3) computational design; (4) a speculative digital tool for design in wire-bending; and (5) technical skill in wire-bending. Design and fabricate lightweight structures using wire-bending techniques. Formulate new ways of reframing computation through craft-making and vice versa. Offer critical perspectives and creative insights into the roles of craft, technological systems and discourses in design, production, and society. General. Develop skills in computational design [Bailey-Derek grammar]. Wire-bending. Develop skills in and understanding of wire-bending at a theoretical and practical level. Theoretical Framing. Develop skills in and understanding of theories in computation and craft for application in design. Papers, physical and digital artifacts and models, prototypes, etc. The course meets once a week for 3 hours. Sessions will consist of lectures, student discussions and presentations, and labs. The course will develop work for dissemination through various outlets including, but not limited to academic publications and conferences.